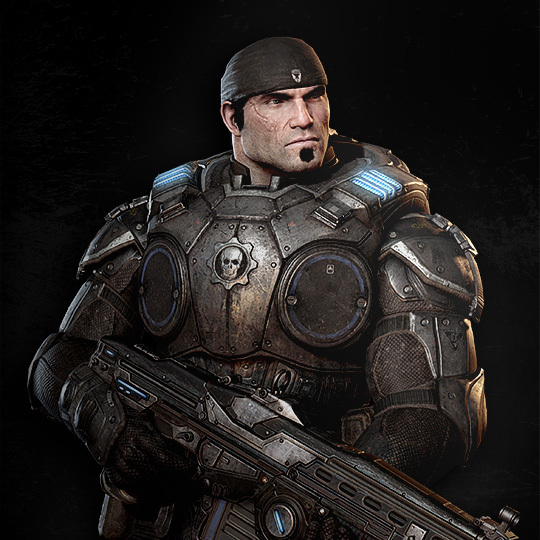 Marcus Fenix is the main character of the Gears of War trilogy. Focused, strong and determined, he's a natural leader who keeps his problems to himself and continually puts his life on the line for others. Son of famed military scientist Adam Fenix, Marcus Fenix established a reputation as a brilliant soldier during the Pendulum Wars, earning numerous field promotions and decorations. He was on a fast track to an outstanding military career--until he defied orders that would have protected Jacinto Plateau from the Locust. He made this choice in order to save his father. He was put in Jacinto Maximum Security Prison in 10 A.E., only to be rescued by Dominic Santiago four years later at the age of 36; this marked the beginning of Gears of War 1. Since then, he has become the leader of Delta Squad and a celebrated war hero.